Nothing formal, just a few I knew of. If anyone has a link to share add it in a comment and I will update the list. Wow! I can't believe all those guys are done and gone! At least most of the CVI stuff is still available from MD. So far so good for Panzerwerks and Armorpax they have managed to keep ahead of the bad economy. It has to be tuff to survive in this economy and in such a small hobby as 1/6th. Probably time to redo the list! Randy at Monkey Depot is salvaging as much really good stuff from the ruins of this economy as he can. He is a really dedicated, smart retailer/collector. 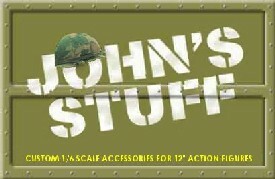 Monkey Depot has CVI and John's Stuff merchandise, to name just two. Last edited by Rolling Thunder Tech; 02-10-2012 at 02:08 AM. I think it is about time this was updated, over 2800 hits and most of the posted links are out of date. Just a thought. Good idea Mike. I hope whatever small part SAG plays is a help to all those that make the stuff we all love.